Mesmerize PRO comes with many pre-defined content sections. They are organized into 16 section categories, and each of them can be extended to view the available content sections. Thus, you can add your own selection of content sections to the home page and edit it afterwards. Go to the customizer -> Page Content. Click the “+” sign next to the page content section and you will see the list of available section categories. 5+ overlappable content sections are available in PRO. They come first in the list of available categories, for you to easily find them and apply them to the front-page content. “Overlappable” means the content is indented into the header, for a professional look and a perfect match of the content to the front-page design. The ABOUT sections couldn’t be missing from the list of available pre-defined sections. You can easily choose one to integrate into the homepage and customize it according to your business specificities. Text, images, videos can be inserted into the ABOUT section, to make your presentation nicer, clearer, more expressive or more professional. After giving an overall presentation of the business/personal website, you might want to include more details about what you offer. 10+ FEATURES sections are available, for all sorts of business descriptions. The features might be described in lists and arranged according to the predefined layouts of the available content sections. Or else they might be associated with images, for more advanced designs of the FEATURES content section. Content sections are specially designed to help you provide extensive information about your product/service/offer/etc. It is a sensitive area you might want to treat with a maximum of attention, in order to give your readers all the details they need to get & keep in touch with you. 20+ CONTENT sections are available in PRO, so you can choose wisely one that is perfectly adapted to your business. A clear call-to-action can make a big difference. And if it is enticing, too, you increase the odds that conversions should be maximized. With one of the predefined CALL TO ACTION sections, you add context to your call-to-action and integrate it well in the overall page design. For a more persuasive presentation, you might want to prove your expertise with numbers. This is when the COUNTERS sections will help. A photo gallery might as well be useful for the front-page of your new website. If this is the case, Mesmerize PRO gives you the possibility to insert a pre-formatted GALLERY section into the page. Two versions of the GALLERY are available + the adjacent customization options for each of them. More than counters, a portfolio displayed on the homepage can be a convincing argument for the readers to get in touch with you. Due to the PORTFOLIO sections, you can easily include your projects and display your portfolio in an elegant manner. Available in 5 versions, this section is waiting for you to customize and leave you fingerprint onto the online presentation. These pre-designed sections are more than useful if you plan to sell online. They will help you display your offers to the readers, in a professional and reliable way. Each product/service will have a price attached to it, regardless of the content section you choose from this category. The different versions of display only give you the possibility to apply advanced customizations to this section in the site. Apart from counters and portfolios, testimonials are great for persuading the readers into getting in touch with you. With the pre-designed TESTIMONIALS sections, you can easily add stories from your past or current clients and take the third-party voice as an argument of your reliability. If you deem TESTIMONIALS not quite the right way to convince the website visitors to do business with you, you might want to display an extended list of your clients. Known brands and big companies you currently collaborate with might persuade new customers to come to you. The CLIENTS sections are available in about 5 different versions, for you to choose the one that is perfectly suited to your business. Mesmerize PRO also provides some TEAM content sections. After having chosen the right version for you, all that it remains is to insert photos, names, job titles, descriptions and social media links for each member of the team. Not only bots appreciate content freshness, this is all the more valid for your readers. If you consider them interested in finding the latest news about your company or the industry specific to your business, include a LATEST NEWS section into the website. Mesmerize PRO has some predesigned content sections available for this purpose. The CONTACT section is also an essential element in the pages of your website. Whether you want to include physical addresses, emails, phones or even maps, Mesmerize has you covered. We included 5+ contact sections for you to choose from, where to add your own contact details. Perfectly suited for designing an e-commerce site, the WOOCOMMERCE sections are all variants of presenting the products catalogue, right from the front-page. Chances are that you want your readers to subscribe to a newsletter. This way, you will constantly provide them additional information and added value, with every new post. 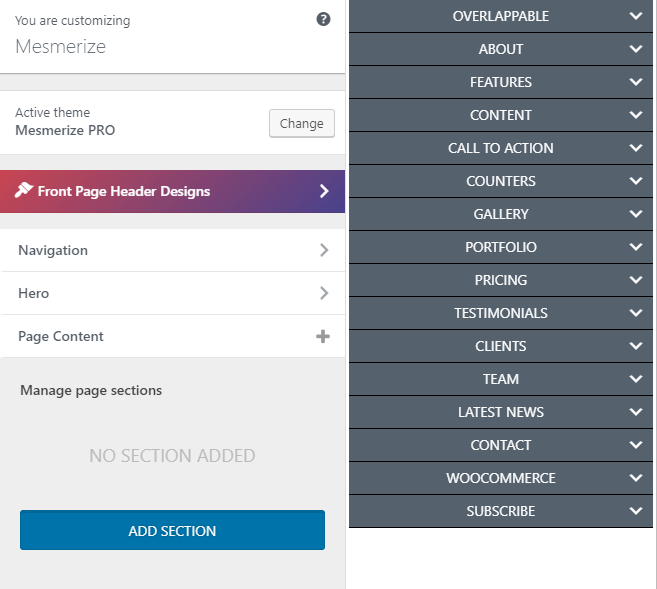 Mesmerize PRO offers several ready-made SUBSCRIBE sections, that need just some customizations to perfectly reflect your business area.